Program-based budgeting is about making budgets more transparent, ensuring that public money is spent on the right priorities, and linking budgets more closely to the purposes of spending. Program structure in program-based budgeting is central to some of the most fundamental questions in public finance reform. As countries introduce program budgeting or reform their existing systems, it is useful to examine global practices to shed light on how governments define program objectives as part of their broader quest to shift budgeting toward results that matter to citizens. 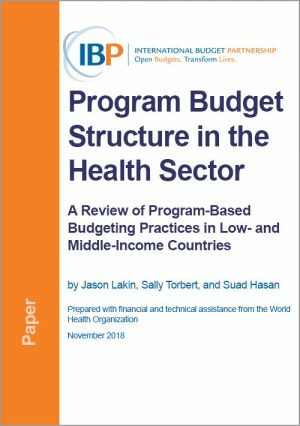 This paper aims to contribute to the global knowledge of program budgeting in low- and middle-income countries through the lens of program structure and its definition and evolution in the health sector. We produce and disseminate research and analysis on a range of topics related to public finance, governance, civil society, and budget advocacy. Sign up to receive email updates on civil society budget advocacy and analysis, public finance management, and more. Connect with organizations working to improve government budget systems, policies and outcomes!